A lamentable issue in the construction industry is that often companies will be too large and streamlined in a trade to be able to take care of all of a customer's needs, or the company will be too small to have the manpower and resources to adequately take care of all the aspects of a customer's project. When a Building Maintenance company who services many large Parking garages in the Boston area found itself needing to take care of replacing the concrete and waterproofing some areas in one of their properties, They called Pumpcoat. Pumpcoat ~ PCI Contractors diversity has made us a 'go-to' company for problem-solving. On this particular project, our customer was experiencing a lot of cracked concrete originating in the expansion joints of the pedestrian ways of one of the garages, and also at the building's entranceway (front Apron). 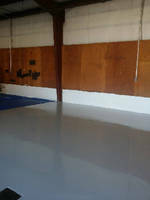 Additionally, they needed a waterproof and durable coating system for these areas. Because the building was extremely busy, the areas that needed coating could not be taken out of service very long, both for the safety of the pedestrians, and the flow of traffic/potential loss of revenue for the building's occupants. A coating with a quick cure time was needed. Pumpcoat ~ PCI Contractors' field service team did a new concrete pour over the previously removed substrate for the Building's front entrance area. They then researched for the most ideal coating for this application and ended up choosing the Tremco Vulkem 'Extreme Wearing System' (EWS ) Coating. This coating has been designed to have extreme abrasion resistance, 'tenacious' adhesion, and cures quick enough so that it can be walked on an hour after finishing the coating. It is versatile enough so that it can be applied even in freezing temperatures, which allows for projects to continue in the colder months. The Vulkem EWS also protects concrete from the damaging effects of vehicle fluids such as gasoline, oils and antifreeze, and de-icing salts and chlorides as might be spread on roadways during the winter. 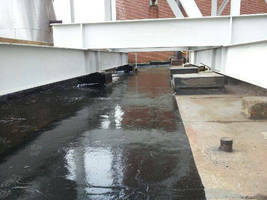 There are four coats to the Vulkem EWS system: a Primer, Base-coat Waterproof Membrane, a Wear-coat, and then a top coat. The system retains its integrity and prevents water migration between itself and the substrate. The wear-coat has an abundance of aggregate so that it maintains high impact, abrasive, and chemical resistance. Each coat cures in an hour or less so the next coat is able to be applied. Pumpcoat~PCI Contractors applied the entire system in less than a day which was scheduled with respect to the customer's least busy time, so they had minimum interruption to their business. 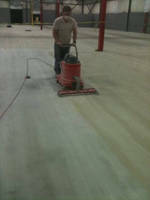 Pumpcoat ~ PCI Contractors are now in their 18th year of service. Our experience continues to help find solutions to their customers problems.